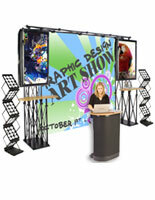 Custom design pop-up graphic included with trade show booths promote to passersby in style. Folding table has handle for easy transport to and from events. 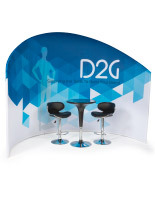 Trade show booths have printed table cover to display your company name! Portable literature rack provides customers with additional information. 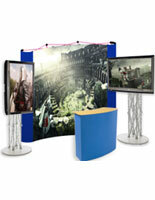 Trade Show Booths with Large Pop-Up, Magazine Racks, Folding Table, & Custom Text Table Cover! 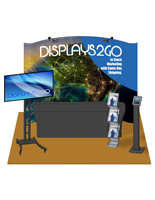 These trade show booths have everything you need to effectively market to potential customers. 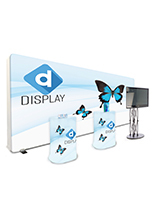 The popup display, like banner stands, features graphics with a custom design for an intriguing look to lure passersby into your exhibit. 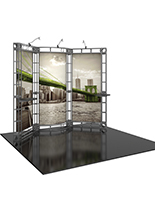 The modular exhibits, trade show booths use (5) small panels and (1) large panel printed in high-resolution 720dpi. The popup assembles in seconds with only one person needed, straight out of the included carrying bag! Exhibit displays, tradeshow units, and other trade show booths like this one also feature folding literature racks with a silver finish. These portable magazine holders can have (10) pockets for holding additional information to hand out to customers. The carrying bag makes bringing this unit to and from events simple. 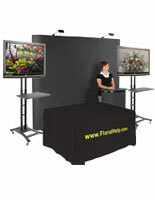 These portable trade show booths have a large folding table for placing merchandise or meeting with clients. This table has locking legs for stability, and a handle for carrying to your convention or other event. 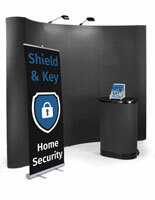 The trade show booths have a table cover with text printing to emblazon your company name for easy recognition. There are (15) colors to choose from to print upon the black fabric. This quality table cover features a 3-sided design, meant to only cover (3) sides of the table. This leaves plenty of legroom along the back for employees to sit! Imprintable area is 18" Tall x 42" Wide. Font is Arial Bold with 2" to 3" minimum letter height. Choose your (1) text color out of 15 available colors! 88.8" x 88.8" x 13.0"